Mars Odyssey Spacecraft -Longest Mission in History- Mapped the Red Planet! This awessome mosaic image taken by the Odyssey Spacecraft focuses on one junction in Mars' Noctis Labyrinthus where canyons meet to form a depression 4,000 meters (13,000 feet) deep. By the middle of next week, NASA's Mars Odyssey orbiter will have worked longer at Mars than any other spacecraft in history, having entered orbit around Mars on Oct. 24, 2001. Odyssey made its most famous discovery — evidence for massive reserviors of water ice just below the dry surface of Mars — during its first few months, and it finished its radiation-safety check for future astronauts before the end of its prime mission in 2004. The bonus years of extended missions since then have enabled many accomplishments that would not have been possible otherwise. 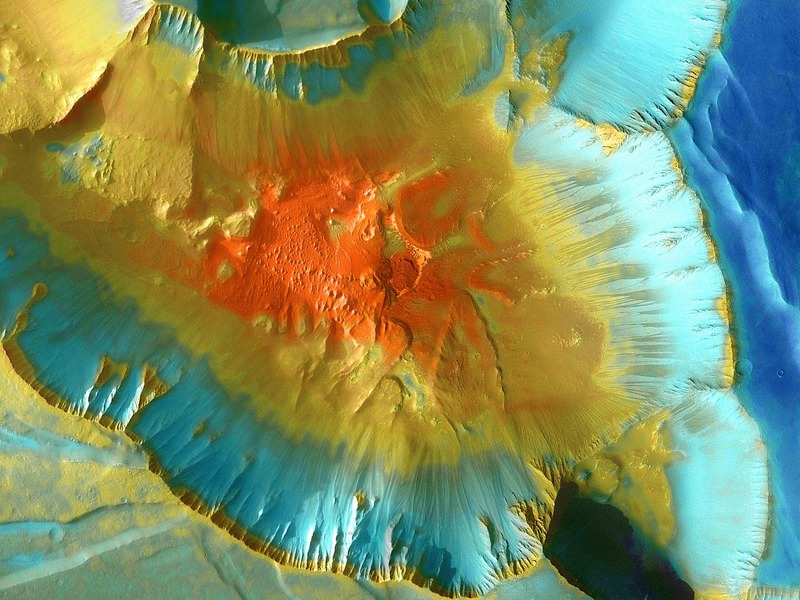 "The extra years have allowed us to build up the highest-resolution maps covering virtually the entire planet," said Odyssey Project Scientist Jeffrey Plaut of NASA's Jet Propulsion Laboratory, Pasadena, Calif. The maps are assemblages of images from the orbiter's Thermal Emission Imaging System (THEMIS) camera, provided and operated by Arizona State University, Tempe. To mark the approach to the Mars longevity record, the camera team and NASA prepared a slide show of remarkable images. The orbiter's longevity has given Odyssey scientists the opportunity to monitor seasonal changes on Mars year-to-year, such as the cycle of carbon-dioxide freezing out of the atmosphere in polar regions during each hemisphere's winter. "It is remarkable how consistent the patterns have been from year to year, and that's a comparison that wouldn't have been possible without our mission extensions," Plaut said. Nearly all the science data from the rovers and NASA's Phoenix Mars Lander has reached Earth via Odyssey relay. Odyssey also became the middle segment of continuous observation of Martian weather by a series of NASA orbiters: Mars Global Surveyor, Odyssey, and NASA's Mars Reconnaissance Orbiter, which began its science mission in late 2006. Odyssey's science triumphs began in early 2002 with detection of hydrogen just below the surface throughout the planet's high-latitude regions. Deduction that the hydrogen is in frozen water prompted the Phoenix mission, which confirmed that fact in 2008. Investigators at the University of Arizona, Tucson, have headed the operation of Odyssey's Gamma Ray Spectrometer suite of instruments, which detected the hydrogen and subsequently mapped the distribution of several other elements on Mars. Additional science partners are located at the Russian Aviation and Space Agency, which provided the suite's high-energy neutron detector, and at Los Alamos National Laboratories, New Mexico, which provided the neutron spectrometer. The mission's science goal of checking radiation levels around Mars to aid planning of future human missions was completed by the Mars Radiation Environment Experiment, developed at NASA Johnson Space Center, Houston. If required, controllers will adjust Odyssey's orbit so the spacecraft is in a favorable position for a communication relay role during the August 2012 landing of NASA's next Mars rover, Curiosity.